Please check our weather policy for inclement weather procedures. Subscribe to our email list and keep up to date on upcoming events and announcements! Click here to subscribe! Take a ride on the Calera & Shelby Railroad! Ride a train back in time! 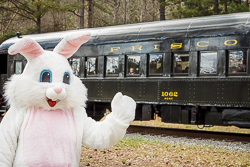 Hop aboard the Cottontail Express for a ride to Peter Cottontail's meadow! Join in the fun at the meadow as we hunt for Easter eggs. A bounce house, temporary tattoos, coloring station, and a sandbox provide lots of family fun. Bring your camera to take photos with Peter Cottontail!